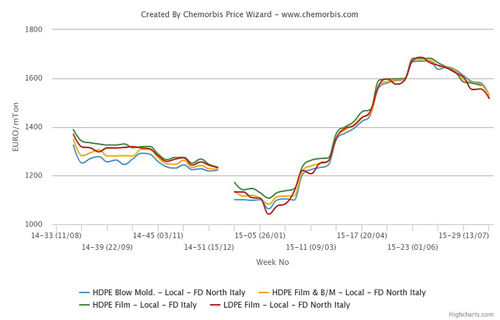 According to ChemOrbis, initial PE prices are emerging with decreases for August in Italy in line with the lower sell ideas reported at the end of last week. Retreating feedstock costs were cited as the main factor contributing to the current bearish trend as ethylene contracts settled with decreases of €70/ton for August, weighed down by improving supply levels and softer spot naphtha costs. In addition to lower upstream costs, the PE market is also under downward pressure from thin trading activities due to the imminent summer holidays when many players will be away from the market for at least two weeks. Regarding supply, concerns are easing while availability is said to be still tight for certain grades. A South European producer announced decreases of €40-50/ton on their August PE contracts compared to July. In the distribution market, on the other hand, initial PE prices are suggesting decreases at least equal to the monomer drop and a few sellers have already conceded to even larger discounts due to thin buying interest. A distributor concluded some initial August PE deals with decreases of €70/ton for West European material in line with the ethylene settlements. However, the seller commented that buying interest is weak so far and added that buyers are taking a waiting stance in anticipation of further reductions for September. Another distributor issued decreases from €80/ton to €100-130/ton on his August PE prices compared to the first half of July, considering Italy’s PE market to be quiet. The distributor reported selling out his HDPE blow moulding allocation for which he already had limited stocks for August. For gentlemen’s agreements, a converter received initial August PE offers with decreases of €50/ton compared to his July settlements as per ChemOrbis pricing service. However, the buyer is targeting to obtain the entire monomer drop after negotiating.